The moment this photo was posted by the Stars on their individual twitter handles, the twitter was at buzz. I just could not take off my eyes from the photo, I was just glued to this photo and just could not stop gushing about it. I was busy discussing and sending everyone these photos and discussing "Awwww, they look so cute". The ideal destination wedding which everyone dreams of. What we should notice is being in the limelight always, they chooses their most important day away from the media and fans. Only when they were hitched, they came in front of everyone. All social websites were at blaze with their pictures of wedding. The destination was the most beautiful countryside resort in Milan (Italy). It was a private affair and was attended by their family members and close friends. I just love this song and it reminded me of my wedding day. When I entered the wedding hall this was the song played in the background sung by @Jasleen Royal and very true for the occasion. 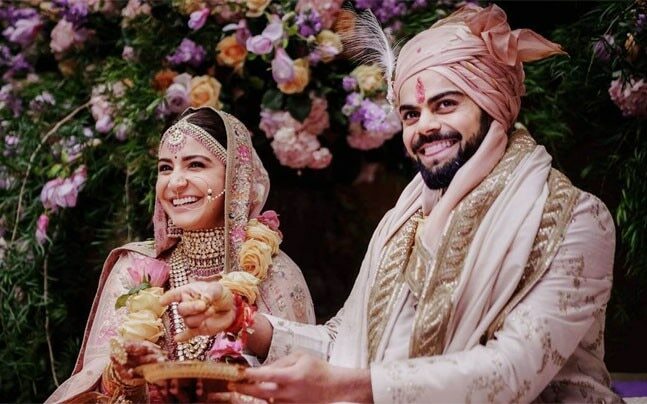 The wedding lehenga of Anushka Sharma designed by Sabyasachi was glittering, as if demonstrating every emotion of the bride, designed in vintage English colors embellished with silver-gold metal thread, pearls and beads. It took more than 32 days and more than 60 karigars (artisans) to embroider the tropical flora and fauna on her outfit. Virat kohli too looked adorable in Sabyasachi ensemble. 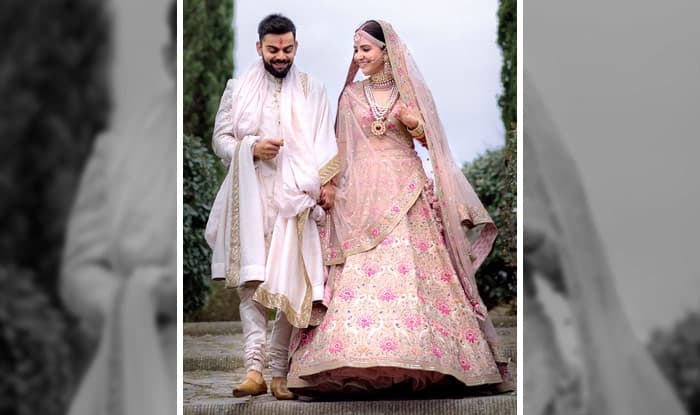 The most adorable moments shared on the social handles were their engagement ceremony where they gave each other a tight hug after exchanging rings, haldi ceremony and what amused us was when he surprised her princess by a song "Mere mehboob qayamat hogi". I think everyone cherished this song sung by him with umpteen sincerity. The every detail be it the reception invitation card which is scheduled to be in Delhi followed by a reception in Mumbai is just dreamy. Every thing is being designed as per the destination which is Italy (Tuscany). I am in love with their wedding and same is the situation with everyone, who are just pouring the congratulatory wishes for the couple. All the brands are endorsing them and congratulating them in the best possible way. Everyone has started updating their status with their pics and it is because we cannot just get over their pictures, they are so ravishing. So here wishing them "Many many congratulations to both of them, you seriously give everyone relationship goals. Have a great new innings. All the very best and lots of love Virushka."